Paul and I drove out to Paramount Antique Mall Saturday. We'd never been there before (we just found out about it). The place is enormous. Quite frankly, it was a bit overwhelming and Paul wouldn't buy me a 1930s waffle iron because he said he didn't want to buy an appliance with someone else's 70-year-old waffle crud on it. Gee whiz. Anyway, I did find a great scarf for $3.50 (I don't know if it's really vintage or silk, but for $3.50, who cares? ), some vintage recipe booklets (of course--how could I resist?) and little Jell-O molds. There were two women in the booth when Paul and I were digging through the baskets of Jell-O molds to find a matching set (We ended up with 10!) who asked me what I was going to do with them. "Mold Jell-O..." I mean, what does one do with a Jell-O mold? The women looked at me like I was crazy (literally like they were patronizing an insane person--"isn't that cute--she uses Jell-O molds to mold Jell-O; she'll never survive in the real world") and proceeded to tell me about some ghastly craft project involving glitter that renders a vintage Jell-O mold inoperable. I think I did a fairly good job of hiding my horror. George Olsen and His Orchestra will make everything better with "Makin' Whoopee!" It's in the public domain, so you can download it from Internet Archive. Since I made This Side of Paradise Pudding, I have become (even more) enamored of gelatin. It is amazing stuff, despite the artificial flavorings. I am losing my "slow food" street cred! These Pineapple-Orange Creams are fabulous. They taste like orange sherbet with pineapple and mandarin oranges. Yum! I'm sure you'll be seeing recipes from these booklets in the near future! I realized I haven't posted a drink recipe in a while, so I'll introduce you to one of my favorite tipples--the Gimlet. All it is is 1 ounce of Rose's lime juice (I want to make homemade some time) and 1 jigger (1.5 ounces) of gin. That's it! It looks like antifreeze in its glowing greenness (which the yellow from the lamp neutralized). I love it. Unlike the rest of my generation, I'm not a vodka kind of gal. Those jello molds are fantastic--thank goodness you rescued them from a certain arts and crafts demise. There is a certain recipe which was popular back in the 60's and 70's that involves lime jello (or was it pistachio pudding? Or both? ), crushed pineapple, and some dairy product (sour cream, cream cheese? ), and miniature marshmallows. BTW, you don't have to lose your slow food cred. You would use unflavored jello. 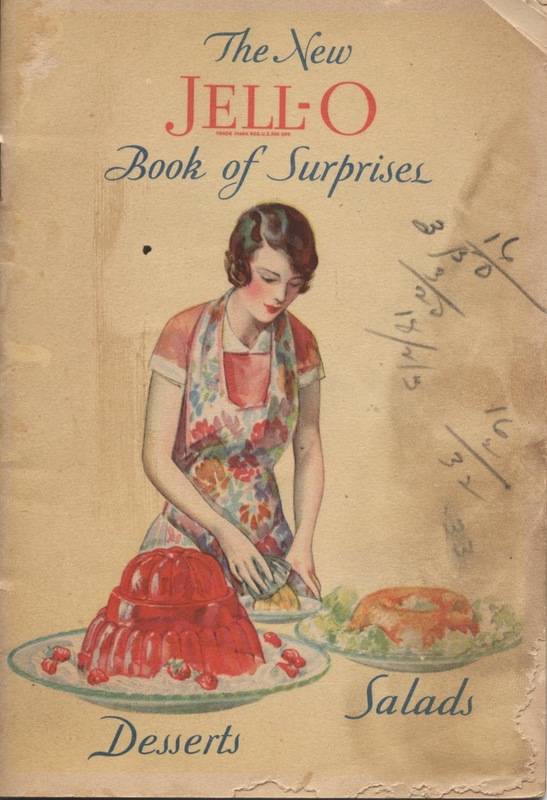 There is an awesome recipe from Jane Grisgson (I think) that makes a three layer lemon jello mold with lemon, whipped egg whites, and unflavored gelatin. Emily- $1 and $2 recipe booklets are really worth their weight in gold! We're a one-income household, so I'm always on the lookout. Laura- would it still be the same without the artificial color and flavor? :-) I keep meaning to play around with Knox and fruit juices, but haven't gotten around to it yet. By the way, how awesome is Jane Grigson? Your pineapple orange creams are so cute! Love the little molds. I think I'm kind of with Paul on the waffle iron (although I'm always intrigued when I see the old ones).